THERE IS A TIME AND PLACE FOR DIFFERENT TYPES OF BUSINESS FINANCE. Often banks may seem to be the preferred place for credit but you need to also consider manufacturers’ “captive” finance programs. They may provide greater structuring, flexibility, terms, and payment options while simultaneously providing an alternative source of capital. Matching the type of financing with your business needs is crucial in delivering positive financial results. For example, what agreement type is most suitable? Chattel Mortgage (Specific Security Agreement), Commercial Hire Purchase or Lease? What is the most effective structure? Seasonal Payments, repaying the GST as a bulk amount after its claimed in your BAS? Fully amortised or a balloon payment? Prepare a detailed business plan on how you will go about repaying your business loan. Be sure to highlight in your business plan how the additional finance will support the future mission of your business. A well developed business plan will be a great help in securing a line of finance with Terex Financial Services™ (TFS). Get to know the business professionals at TFS. 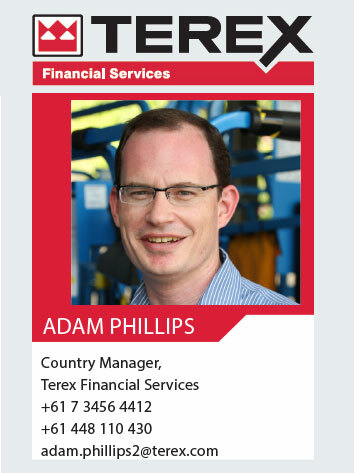 They are Terex Team Members that have many years of experience in the rental channel. They can aid and assist you in developing the appropriate financing / leasing strategies for your business. Establish a relationship today - to get your business finance across the line tomorrow.